English authoress and teacher; born in London about 1820; died there 1885. She was a granddaughter of Isaac Mendes Belisario (see Lyson, "Environs of London," iii. 429), and with her sisters for many years kept a girls' school in which numerous members of the Sephardic community were educated under her direction. 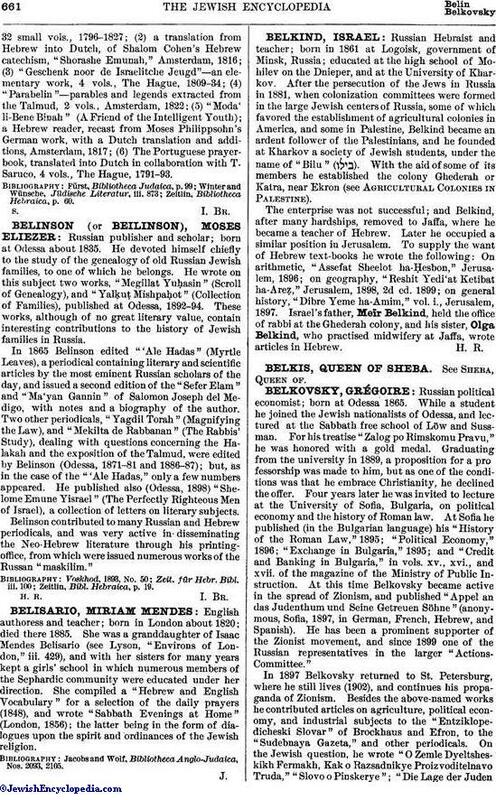 She compiled a "Hebrew and English Vocabulary" for a selection of the daily prayers (1848), and wrote "Sabbath Evenings at Home" (London, 1856); the latter being in the form of dialogues upon the spirit and ordinances of the Jewish religion. Jacobs and Wolf, Bibliotheca Anglo-Judaica, Nos. 2093, 2105.